Cam's Cinematic Episodes: Film Review - RELIGULOUS: Sinfully Brilliant! Film Review - RELIGULOUS: Sinfully Brilliant! "Tell me I'm a sinner I've got news for you/I spoke to God this morning and he doesn't like you!" This song lyric ran through my head a couple times during Religulous, the stunning new documentary from Borat director Larry Charles, as I watched the film’s writer/narrator/interviewer Bill Maher, formerly of Politically Incorrect, impishly journey through the inner-most sanctums of organized religion and spirituality. 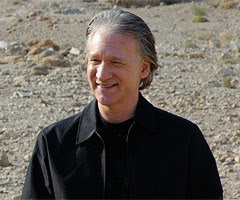 There’s an infectious coiled energy that permeates from the diminutive outlaw comedian’s illusionary facade of laid-back cool, and this devilish fearlessness makes him the ideal master of ceremonies for Religulous, a film that has proven, predictably, to be a firebrand for controversy over the last couple of months. Opening the film standing on the site of Megiddo, the Christian prophesied site of Armageddon, Maher state s his thesis immediately: that religion is detrimental to the progress of humanity. There’s a jolt that comes with hearing a statement such as this spoken aloud as we’ve been socialized in North America to practice a sense of hesitant respectfulness when discussing religion. It’s a private matter, best discussed among family and members of your spiritual community. This, to paraphrase Maher, is bull-pucky. 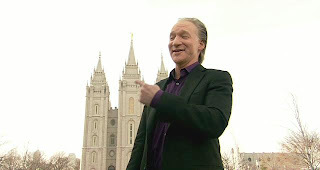 Maher, a lapsed Catholic whose beliefs fall on the agnostic side of the spectrum, isn’t comfortable with current political structure of his country, much less the world, where the fate of the globe rests in the hands of individuals who are more concerned with the next world than this one (a clip of George Dubya citing his Christian beliefs as being vital in forming America’s foreign policy is particularly troubling). He’s annoyed by the hypocrisies, prejudices and manipulations that are perpetrated by misguided members of the religious right. But most of all, Maher is just plain tired of people being unwilling to admit that “they just don’t know”. So, we follow him as he journeys the world in search of answers. He talks to a gold-bedecked evangelical preacher who attempts to use Bible quotes to defend his right to wear expensive lizard-skin shoes. 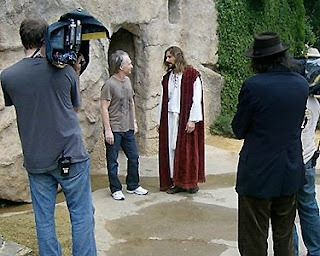 There’s a hilarious meet-and-greet with summer-time tourists at Holy Land, a Florida-based Christian theme park (Check out their website at holylandexperience.com and be awestruck at the wondrous depths of crass commercialism), where an actor playing Jesus catches Maher off-guard with a uniquely astute religious analogy. And in the final section of the film, our Host with the Most asks some very pointed questions inside a Jerusalem-set Islamic temple. 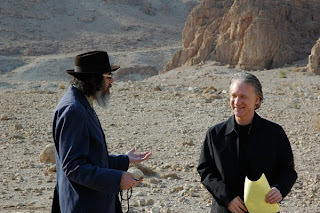 This is very uncomfortable territory for many, and Maher and Charles are very aware of this fact, so they’ve used their years of comedy-writing experience to mo uld Religulous into a comical odyssey, packed with tightly-edited beats and amusing inserted film footage and subtitles. Their attention to the golden rules of comedy story-telling has allowed the duo to create one of the funniest films of the year, a veritable playground of wit and ideas which results in a memorable and absorbing film-going experience. Now, there’s no doubt that your own personal beliefs are going to weigh heavily on the movie-going experience that Religulous provides. Many will have a hard time dealing with the giddy cheap-shots that Maher is inc lined to make (though usually in the service of a larger point). I think what makes it a worthwhile, even important, film to see is how Maher uses the film, not as a tool for vindictive intolerance, but rather for probing curiosity. He’s fascinated by religion, not afraid to lay bare his frustrations with its practices and dogma, and yearns for rational thought to find its place above personal ideology for the sake of humanity’s future. It must be said, I suspect that the film’s latter sections will lose some viewers. 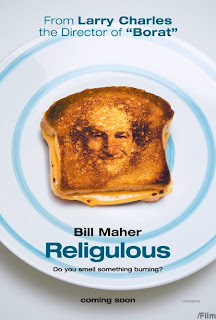 Maher’s exploration into the Islamic religion doesn’t have the care-free humorousness that the sections on Mormonism, Scientology and Christianity do, but it’s an appropriate choice for a couple of reasons. Firstly, due to the more serious and sensitive current political nature of the topic, and alternately, this transition better eases into the culmination of the film: a dazzling crescendo of imagery and gospel music, wherein Maher provides an impassioned call-to-arms for “non-believers” to speak up and make their minority voices recognized, as well as an appeal for people to recognize man’s propensity for just plain screwing up a lot. Religulous will likely be more willingly embraced by the academic (read: liberal) crowd, who will appreciate the incisiveness and lack of pandering on display. Maher and Charles have made a truly great film that will entertain the many. But I think the real strength of the film lies in the fact that once the laugher dies down, intelligent discussion and debate is likely to ensue. And there’s nothing “religulous” about that. *Originally published in SFU's The Peak: Oct. 6th, 2008. Film Review - EAGLE EYE: Blindingly Stupid.